African Women, Hit Hardest by Climate Change, Forge New Solutions Across the Continent | Democracy Now! delegate from Nigeria, with the Women’s Caucus and the Women and Gender Constituency here at the U.N. climate summit. program coordinator with the Kenya-based Indigenous Information Network. She is a member of the Indigenous Peoples’ Caucus and the Women and Gender Constituency here at the U.N. climate summit. Africa has been praised here in Paris for leading the way on renewable energy, with the African Development Bank announcing this week it would spend $12 billion on energy projects over the next five years. But as Africa forges ahead, will it leave behind women, who often bear the brunt of impacts from climate change? Across the continent, African women are creating their own solutions. We’re joined by climate justice activists from both sides of the African continent. Priscilla Achakpa is a delegate from Nigeria and is with the Women’s Caucus and the Women and Gender Constituency here at the U.N. climate summit. She is the executive director of the Women Environmental Programme in Nigeria. Edna Kaptoyo is with the Kenya-based Indigenous Information Network. She is a member of the Indigenous Peoples’ Caucus and the Women and Gender Constituency here at the U.N. climate summit. AMY GOODMAN: We’re broadcasting from COP21, from the U.N. climate summit in Paris, France. We’ll be here for another week covering the Paris accord. I’m Amy Goodman. Well, it’s called the “family photo,” the image of over a hundred world leaders who gathered here in Paris on the opening day of the U.N. climate summit. Organizers said it marked the largest gathering of heads of state in history. But who is missing from the picture? Perhaps there’s a clue in the French national motto—”Liberty, equality, fraternity.” Where are the women? Only a handful of female heads of state appear in the photo of this global fraternity. And when it comes to heads of national delegations negotiating a global climate treaty here at COP21, women are still few and far between. We turn now to two African women who are making their voices heard here at COP21. Africa’s been praised here in Paris for leading the way on renewable energy, with the African Development Bank announcing this week it would spend $12 billion on energy projects over the next five years. 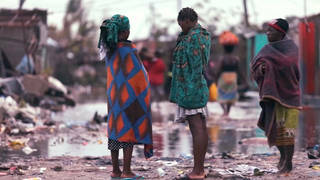 But as Africa forges ahead, will it leave behind the women, who often bear the brunt of the impacts of climate change? We’re joined here by two climate justice leaders from both sides of the African continent. Priscilla Achakpa is a delegate from Nigeria. She’s with the Women’s Caucus and the Women and Gender Constituency at the U.N. climate summit. She’s executive director of the Women Environmental Programme in Nigeria. Edna Kaptoyo is with the Kenya-based Indigenous Information Network. She’s a member of the Indigenous Peoples’ Caucus and the Women and Gender Constituency here at the U.N. climate summit. PRISCILLA ACHAKPA: Thank you very much. AMY GOODMAN: Priscilla, let’s begin with you. So that picture, I’m sure you saw it. It’s gone all over the world, the “family photo.” Talk about who’s missing. PRISCILLA ACHAKPA: Well, we’re here—first and foremost, thank you very much for bringing the issue of Africa continent at this COP, which is very crucial to the African women. Just as you have said, when it comes to the issues of negotiation, the African women are most of the times completely absent or nearly absent. And this is something that is very important for us, because we cannot be talking about negotiations that half of the populations are affected, which are the women. And then, the issues that are being discussed, they are completely being neglected, or they’re not even involved at all. For us, coming from the background of Africa, this is something that is very crucial for us, and it’s something that we want our leaders to really take on board and look at it very critically, because we cannot be discussing the issues that affect us without us being at the table to negotiate these issues. AMY GOODMAN: Ban Ki-moon said climate change affects us all, but it does not affect us equally. Why do women bear the brunt of the effects of climate change? AMY GOODMAN: Explain where Lake Chad is. PRISCILLA ACHAKPA: Lake Chad is a river. And this river was feeding over millions of people in the 1970s. Lake Chad’s river basin is now dried up. Hundreds of millions of people have been displaced as a result of the drying up of Lake Chad. And most of the people that are affected are women and children, because the men are forced to migrate, but the children cannot leave, because they have the children there to take care of them. So the women, most of the times, are forced with the impact of climate change, and they continue to live with it daily. AMY GOODMAN: How does climate change affect the politics of Nigeria? Interestingly, recently, U.S. Secretary of State John Kerry talked about the role of climate change in Syria’s civil war and also with Boko Haram in Nigeria. PRISCILLA ACHAKPA: Well, coming from the issue of the Boko Haram—and I’ve often said that when we’re addressing the issues of Boko Haram, we should look at the issues of environmental insecurity, because if we address the issue of environmental, which many factors are being affected—the rivers are drying up, the source of livelihoods of most of the people who are dependent upon these rivers, including the Lake Chad, which is situated in the northeast part of Nigeria, and therefore a lot of people have been displaced. There’s poverty. Their source of livelihood is completely eroded. So when you take out the source of livelihood of these people and you leave them with no option, no alternatives, of course the tendency is that they resort into violence. And it’s said an idle mind is the devil’s workshop. Where are they supposed to get what to take care of themselves? Because, I mean, Lake Chad and all these places were the source of their livelihood. AMY GOODMAN: What are you doing around solar power and microcredit, and how do they relate to women’s development in Nigeria? PRISCILLA ACHAKPA: Our organization, Women Environmental Programme, is dealing very much with the issues of solar power, solar dryers, particularly. AMY GOODMAN: What are some of the crops? PRISCILLA ACHAKPA: First and foremost, you have tomatoes, you have onions, you have pepper, you have oranges. Most of these crops, I mean, are being destroyed, because the women do not have the storage for them. And how to package them becomes impossible. So, for us, in our organization, part of what we are looking at: How can we help the women to package some of these products, that they will be marketed even when it’s off season, instead of throwing them away? And that was how we brought in the issues of solar dryers, that we’ve been using very much. And the women have learned—I mean, a part of it has—I mean, true cooperatives. Once one come to dry up, they use that process of generating kind of income back into the system. So even when it’s off season, they still have tomatoes, they still have pepper, to be able to sell out. AMY GOODMAN: We’re talking to Priscilla Achakpa of Nigeria and Edna Kaptoyo, who is from Kenya. Actually, President Obama just visited Kenya. His father is from Kenya. Can you talk about the droughts there and what you see as the challenges of climate change for your country? EDNA KAPTOYO: Thank you for the opportunity to speak at this event. Yes, President Obama is from Kenya, and, of course, we also demanded that he focus on climate change. Kenya, we have experienced a lot of climate change impacts. And the past droughts we’ve experienced from the year 2009, 2010, were very severe. I come from a pastoralist community. The droughts we used to experience like lasted for a couple of months, and then we would have rainfall. But that period of time in 2010, we had drought that went over past two years. We never saw a drop of rain in areas like the northern part of Kenya. We lost our livestock. Our water access was terrible, because fresh water is dependent on the rainfall. We never had water within our communities, and that really impacted on our community, which is dependent on the mobility to access this water and also to feed the livestock. And this affected the women especially, because we had to migrate from places to places, because we are nomadic people, and some are sedentary people, but the men had to migrate from the communities to move to the cities to be able to provide for their family. And the women were left behind to fend for their family with no resources, nothing to feed them on, because some do not farm at all. They’re dependent on livestock. So we lost a lot of livestock. And this has affected our livelihood, as well. AMY GOODMAN: So, what does this conference have to do with you? EDNA KAPTOYO: I am here because I want my voice to be heard, because I’m—as a young woman, I believe that this process, actions that are being discussed here will be realized at the community level. And as women, we also want to say we are faced with the impacts of climate change, but we are also doing something in the community to mitigate this impact and to adapt. We are doing initiatives on fresh water harvesting. We do harvesting of rainfall water. We do initiatives to protect our water catchment, but we also want the leaders to do something on the ground. And we want the resources to reach the local women. If it doesn’t reach the indigenous women, the local level, like the Green Climate Finance, how are we able to support our communities? How are we able to continue with our livelihood? So we are here because we believe women’s rights matter, and we want justice in this process. And we want them to make a difference and to move from negotiations into actions. AMY GOODMAN: So, what difference does it make when women are at the negotiating table? And how are you trying to get more women there? EDNA KAPTOYO: Women being at the negotiating table, they’re able to bring in our priorities, our needs, to the agenda at the table, because we say we have the same sky, but different impacts. How it impacts me, I know what the climate change does to my community. I know what kind of intervention that is needed. And that’s why we need more of our women delegations and women from the community to bring their voices here and say these are our priorities and these are our needs, so that it can be tailored to fit our needs back at home and locally, because that’s where the actions will be realized. AMY GOODMAN: Can you talk about, Priscilla, the Africa Fund and what it would mean, and how you want that money to be distributed, and how, in fact, it is being distributed, or will be? PRISCILLA ACHAKPA: Yeah, I was in the hall when the president of the African Development talked about the $12 billion and which specific funds was going to be allocated to the women. For me, that was heartwarming. But then, we were very concerned how these funds was going to be allocated, because sometimes we hear such funds, but when it comes to the actual disbursement of the funds, it never gets to anybody, especially the women groups. So, for us, we want to see the practical disbursement of—practical applications of these funds reaching especially the grassroots women, without all those ambiguous and difficult conditions that will be attached to it on how women will access this grant. We want to see more of the women being—I mean, using those funds, applying it on the ground, but also using it as kind of solutions to address the impact of climate change for them. And so we are calling on the bank—while we are very much happy that the bank has talked about the money for special funds for the women, we want—we don’t want a fund that at the end of the day the women will not be able to access it. AMY GOODMAN: Well, I want to thank you both for being with us, Priscilla Achakpa of the Women Environmental Programme in Nigeria and Edna Kaptoyo, who is with the Indigenous Information Network in Kenya.